Did you know statistics show that over 60% of all ERP implementations end in failure? That's a pretty startling statistic considering that most ERP implementations costs several thousand dollars and could potentially cripple your business if anything goes wrong. Knowing the common reasons ERP implementations fall short and how to avoid them can save you valuable time and money and help make your project a success. 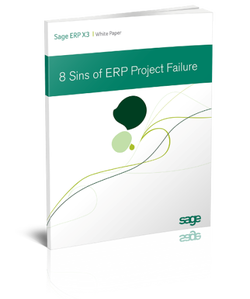 That's why Sage published this whitepaper - to help you understand the 8 Deadly ERP Implementation Sins and the best practices to avoid them. Common factors tat can interfere with your ERP project before you even begin implementation. How to define implementation failure so you know what to look for. How a successful ERP implementation looks so you know what to meaure.